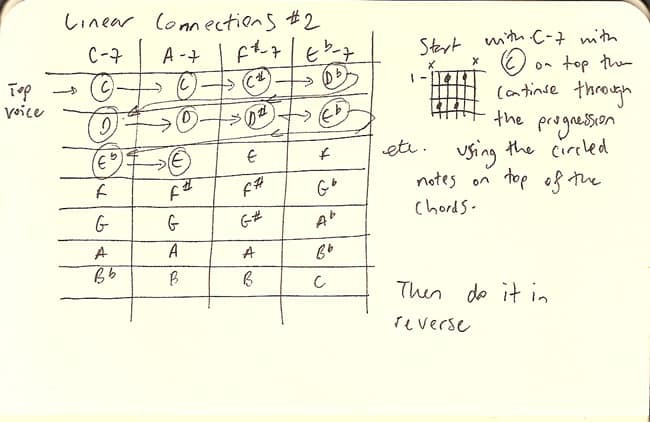 Same chord progression: C-7 A-7 F#-7 Eb-7, but this time you apply the Linear Connections idea to chord voicings. The idea is to make the smallest movement on the top voice of the chords as you move through the progression. If there is a common tone between the chords, use it. Always ascending. You could do the same exercise but apply slightly different parameters, such as ‘move to the nearest note’, or ‘next available chord tone’. So start with C-7 using C as the top voice and move to A-7. You’ll see from the chart that there’s a C in A dorian so keep the C on top but change the chord to A-7. For F# dorian there’s no C so move to the next available note within the scale; that’d be C#. Continue in this manner. Then start high up and do the whole thing in reverse.